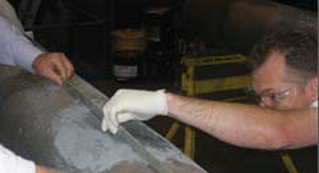 An additional segment of the PRT product line is epoxy coatings and adhesives. Our 100% solids epoxies are industrial grade, extreme service products that we use as an integral part our composite repair systems. We work directly, in person with the formulator / manufacturer. This allows us to customize performance characteristics of our products to suit particular projects. Since our specialty is knowing what products to use on a given repair design, we utilize epoxies with differing capabilities. We have specialized formulations for high temperatures, high chemical resistance, underwater applications and even a system that can be applied in the presence of hydrocarbons. In addition, the cure times for our epoxies can be adjusted from several hours to as little as 5 minutes to suit the application. It is a widely understood and accepted rule that adhesives and coatings will not adhere well in the presence of hydrocarbons—until now. We now have a 100% solids, Kevlar® reinforced epoxy that will adhere and fully cure in kerosene, diesel, gasoline or even crude oil. PRT Gas-Pruf 130 / 132 can actually be applied under the surface of fuels or oily water with tremendous results. It is designed for difficult surface preparation applications in tank interiors and pipeline work. We know of no other product with its amazing capabilities. 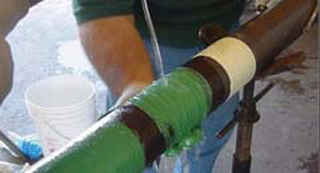 Few extreme service coatings perform well being applied and cured under water—ours do. We actually have a wide variety of 100% solids, Kevlar® reinforced epoxies that are designed to displace water from the application surface. No more checking the weather or humidity or expensive coffer dams for marine coatings projects. PRT Bio-Dur, Bio-Gard and Bio-Fix epoxies are available with task specific capabilities and can be applied and fully cured above or below the surface. They are easy to work with and can be applied by hand, heated plural airless roller, applicator pad or sprayer. Another multi-tasking 100% solids epoxy we have can also be applied in wet and adverse conditions. It is highly chemical resistant and is designed for corrosive/erosive applications such as tank linings and heat exchangers with aggressive environments. PRT Bio-Gard 255 has the ability to withstand chemicals such as 50% caustic soda and 98% sulfuric acid without degradation. There are some epoxies that are tough and some that are heat resistant, but very few are both—-we have the answer. PRT Bio-Gard 300 high heat industrial and marine epoxy coating maintains its toughness and adhesion in constant service temperatures of up to 400° F. Unlike others, it is also non-hazardous which simplifies your DOT, IATA and IMO shipping requirements. When you need fast repairs, every minute counts. Our quickest cure 100% solids epoxy takes just 5 minutes at 77° F. PRT Bio-Fix 911 allows high build, thick applications and can also be applied underwater without affecting the curing process. This Kevlar® reinforced compound is one of our most versatile products because it can be used as a patch, an adhesive or a filler material. It’s ready to grind, shape or contour in 5 minutes above or below the water line. 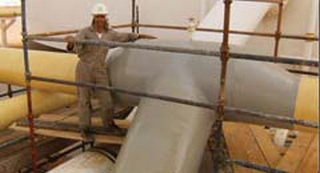 PRT epoxies and coatings are 100% solids products. What this means is that these VOC-free, environmentally friendly compounds use no solvents in the chemical reaction curing process. This assures full curing properties by eliminating the possibility of trapped solvents under the surface of the application. 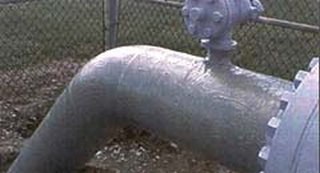 This promotes full encapsulation and adhesion integrity in critical applications such as pipeline and infrastructure projects. PRT epoxies and coatings absence of solvents also allows for high build or thicker single coat, self-leveling applications. This reduces time and labor requirements, lowering costs. They also have limited or no odor during the application and curing process which makes ventilation sensitive installations possible. 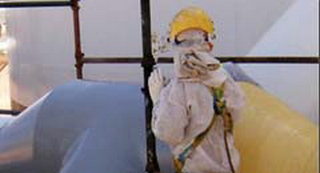 PRT epoxies and coatings are non-hazardous and non-toxic. This advantage reduces DOT, IATA and IMO transportation requirements and shipping costs. 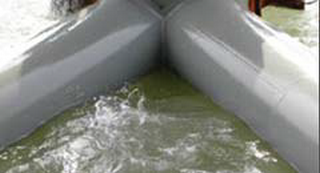 Marine projects and environmentally sensitive applications are also simplified. PRT epoxies and coatings are surprisingly easy to use. The part A (epoxy base) and part B (curing agent) components are contrasting colors so it is easy to see when they are properly mixed. 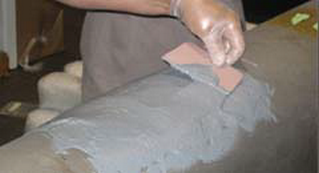 For small areas, the products are easily applied by hand using a brush, roller or spreader. For larger coverage areas, application can be made by a heated plural airless pump system. This equipment heats parts A and B for easier flow, mixes the two components and delivers them by hose to a roller, applicator pad or sprayer for surface application. PRT epoxies and coatings are fully compatible with other PRT composite products. Because they are solvent-free they will not harm or soften existing surface coatings. 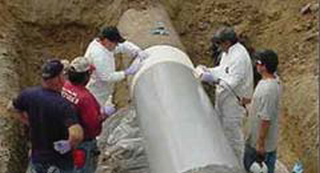 They are also compatible with and adhere to substrates such as metal, concrete, wood, fiberglass, plastics and all types of piping materials. Below are few examples of PRT epoxy and coating applications. Please contact us with any questions about your specific project needs.